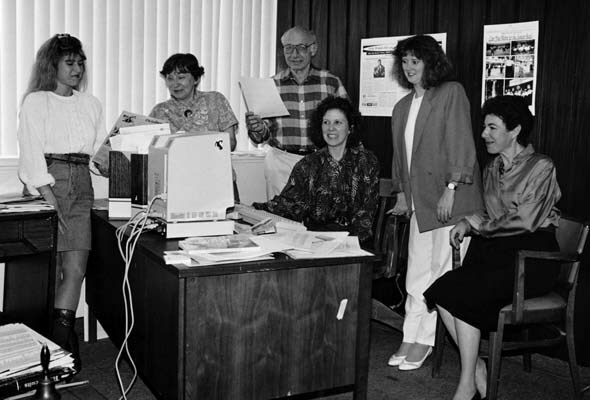 Senior Times staffers gather around their giant computer deep in the 1980s. In October, The Senior Times celebrates 27 years of bringing you the issues. Our presses started rolling back when hair was big, shoulders were wide and fax machines were the best thing since the rotary-dial phone. We have tons of fun things planned for our anniversary issue, but we also want to celebrate our greatest asset, the thing we are most proud of: You. Send us your best ’80s photos—don’t be shy of those high-waisted pants and bright blue eyeshadow—and we’ll share them on theseniortimes.com and publish the best ones in our October issue. Email editor@theseniortimes.com with 1980s in the subject line. Be the first to comment on "Celebrate our birthday with your ’80s memories"